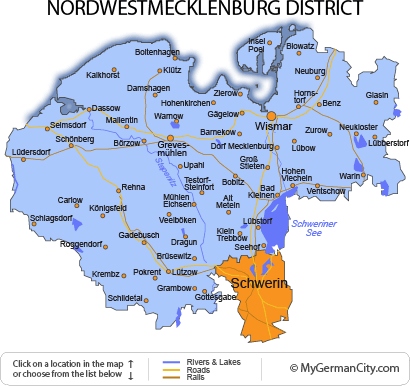 As its name suggests, the Nordwestmecklenburg District sits in the north-west corner of the state of Mecklenburg-Western Pomerania, and borders onto Schleswig-Holstein and the Baltic Sea. It almost entirely surrounds the UNESCO protected city of Wismar on the coast, touching the state capital of Schwerin to the south, and sharing waters with the historic city of Lübeck to the north-west. It is a very popular region for tourists and local German holiday-makers, with its fine sandy beaches stretching for miles and the pretty towns that follow the promenades. Boltenhagen is a perfect example of such a place with a 5km/3mi boardwalk and a fine, shallow beach that is ideal for families. The ancient town of Grevesmühlen, dating back from the 13th century, believed to be one of the oldest towns in the state with some fine architecture.